New foundation releases get me really excited (yes I realise that makes me sound like I have a very sad life). Due to my oily skin, I always struggle to find a foundation that stays put without looking cakey and I'm constantly on the hunt for a revolutionary foundation for us oily gals. As a student, L'Oreal True Match foundation was my go to for a beautiful base that didn't break the bank and when I started working I invested in some more expensive foundations from Estée Lauder and MAC. And you know what? I truly think that L'Oreal does it better, especially with their newest addition to the line-up. 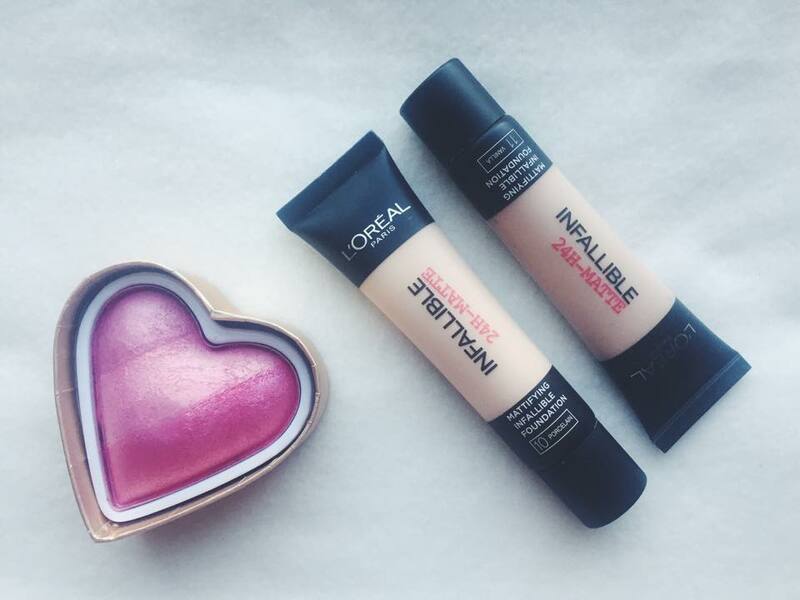 Enter L'Oreal Infallible 24 Hour Matte. Right off the bat, I will say that I do not think this foundation lasts 24 hours. But there again I don't know who would want their foundation to last that long anyway! As I have said before, even Estée Lauder Double Wear goes shiny on me after a couple of hours so I'm not the best person to ask in terms of foundation longevity as my face just melts make up away. That being said, even my skin still looks great after a few hours of wearing this gorgeous foundation. The formula goes on quite matte to start with but as it adjusts and mixes with the natural oils from my skin it gives more of a satin finish. Another thing to point out is addressed to those of you with drier skin types - don't be put off by the fear of this 'matte' foundation drying out your skin. I promise the creamy formula will not make your face feel dry or stick to dry patches! If you have used the L’Oreal True Match foundation you will know that the formula for that is pretty watery whereas the Infallible Matte is thicker but it still feels fairly light and creamy on the skin. It gives really good coverage and I mean, seriously good. I have bad acne scarring on my cheeks and I can wear this foundation alone to cover it up without adding concealer on top like I normally do. Basically I love this foundation, I feel like it gives the perfect finish and coverage for my skin type and it is only £6.99. Seeing as I will be returning to uni and poor student life again in September, I will no longer be able to afford my beloved MAC Studio Fix Foundation. The thought of that used to make me feel slightly panicky but now I have this in my life I can sleep easy, in fact I think I actually prefer L’Oreal Infallible Matte to any other high end foundation that I own. I think when you do a full make up face with blush and bronzer, it's okay for your foundation to be a bit lighter. If you warm up your face really well with a bronzer, you won't see the colour of your foundation anyways. I do think you should match your foundation to your neck, rather than to your face. When I start getting pale in the winter and my curent foundation gets a bit too dark, i always have to put foundation onto my neck and even a bit on my decolleté when it's shown. Otherwise my face is too different from my neck. When it's lighter than your neck, you can always bronze a bit and that's way easier that spreading out your foundation on your neck. i really need to try this foundation!